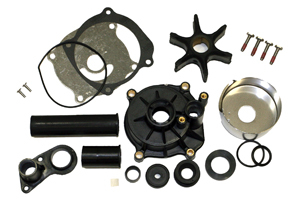 Sterndrive Replacement is committed to provide you with the finest quality Johnson/Evinrude Lower Unit Water Pump Kit on the aftermarket at the most affordable price possible. With our virtualized inventory, we really are ahead of the curve in the e-business in North America. Additionally, you can also benefit from our 1 year warranty with your purchase. Your package will be shipped overnight and will be delivered within 1 business week.